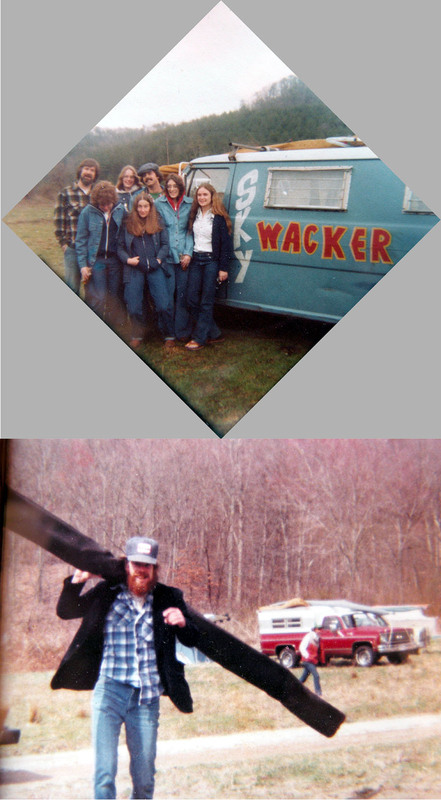 The 'Wackers have been around since the 1970's, and have gone through some changes over the years. The above patch was from the 70's, and was sent in by Wacker Jack Stephenson. For a good introduction to the early history, check out the Call Of The Skywacker, written by Randy Newberry - once voted President for Life. Randy recently received the first ever Boo Waa Award awarded by the Skywackers. 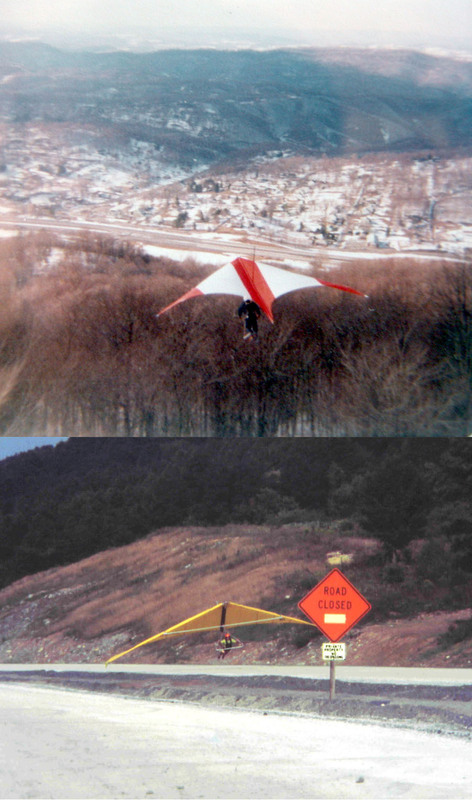 Randy Newberry on the McPeaks training hill, east of Bland, Virginia, flying his Chuck's Glider Supplies Spitfire. November 1976. Who needs battens, luff lines, or wheels? 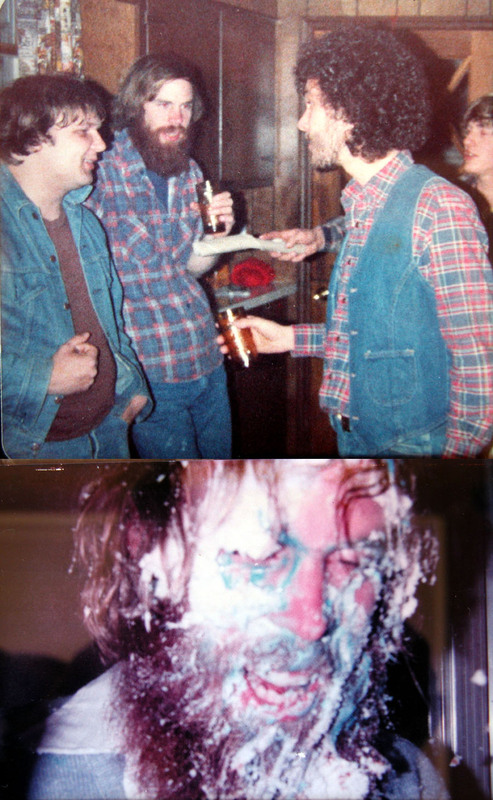 Upper photo: Don Walters, Wisconsin; Jackie Bob Mustard, Bland, VA; ??? 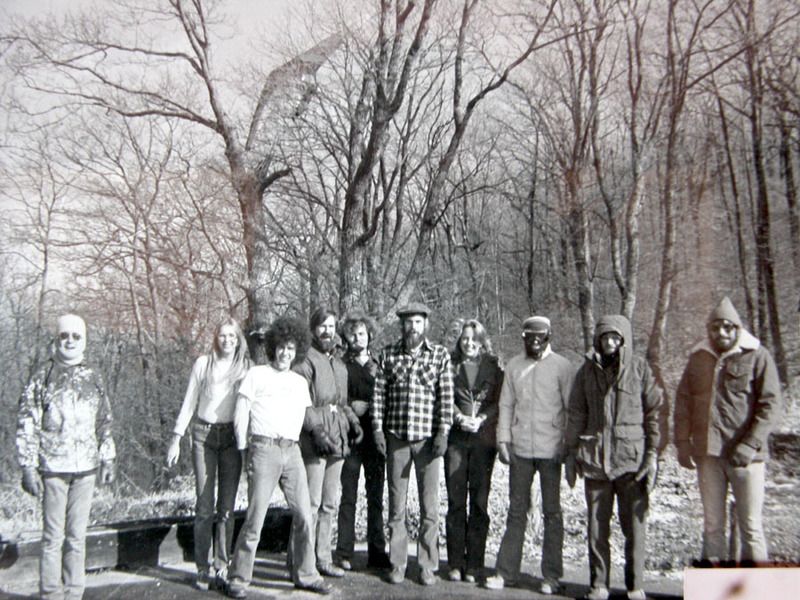 ; Pat Mitchell, Bland, VA; Fred Straccia, Massachusetts; Kathy Sink, Bland; ??? 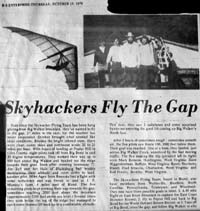 East River Mountain was once a popular Wacker flying site, with a launch overlooking Bluefield, West Virginia. There was a K-Mart to the left which commonly generated the Blue Light Special house Thermal. 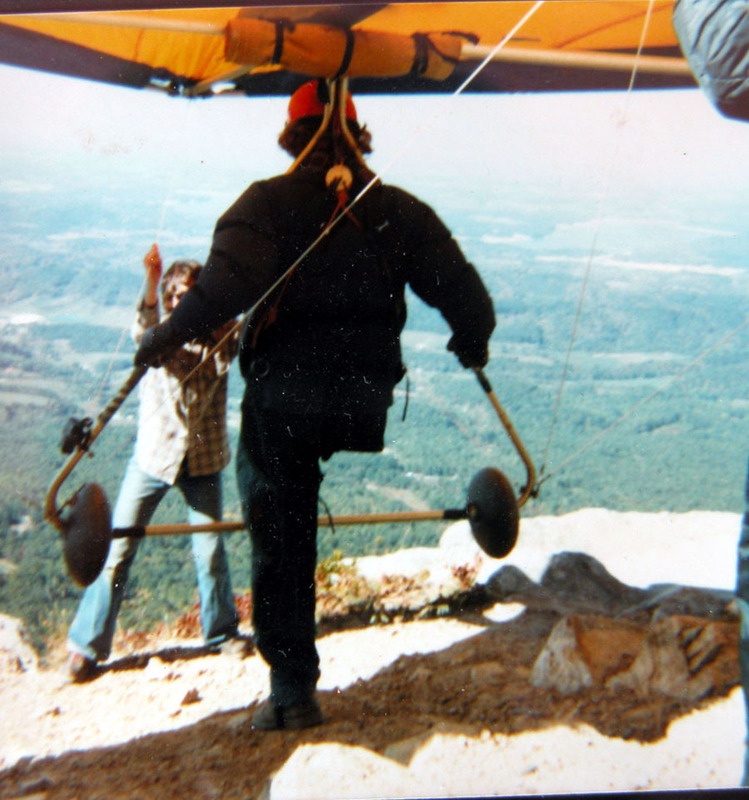 Randy Newberry preparing to fly from High Rock on Big Walker mountain, April, 1978. His Boy Scouts are along to witness the event. 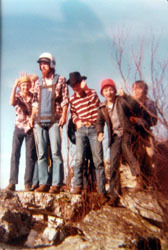 John Muncy, Randy, Mark Newberry, Paul Dillow, ?? 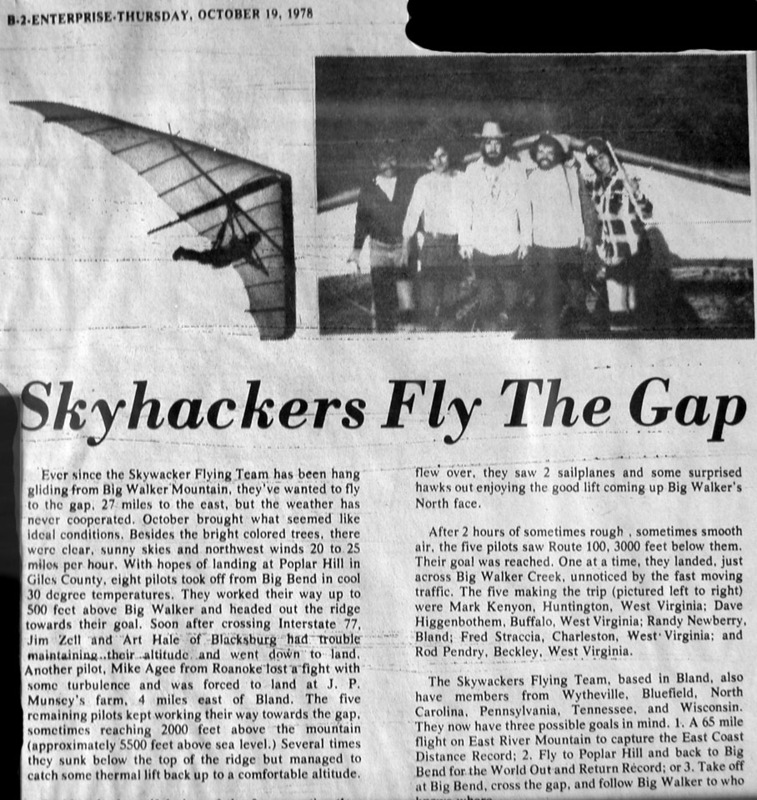 This is a news clipping from October, 1978 about a 27 mile flight on Big Walker Mountain. 5 pilots made the flight: Mark Kenyon, Dave Higgenbothem, Randy Newberry, Fred Straccia, and Rodney Pendry. Jim Zell, Art Hale, and Mike Agee started the flight, but were forced to land before the Rt 100 Gap. Randy Newberry's house in Bland, Virginia, was long the Skywacker Official Party House (and Randy was once voted President for Life). Many are the tales from those days, such as the passed-out pilot who awoke to find himself in a full body cast. Having only one leg did not prevent Tip Rogers from flying. 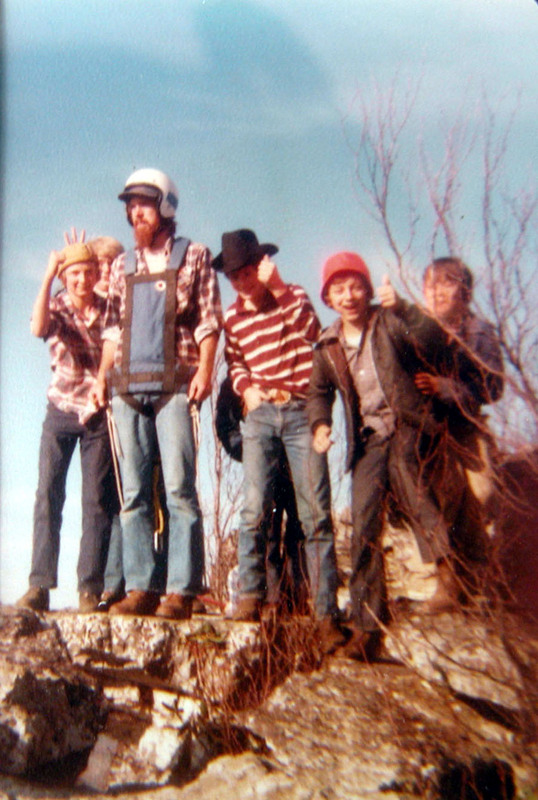 English Mountain, Tennessee, Fall 1981. 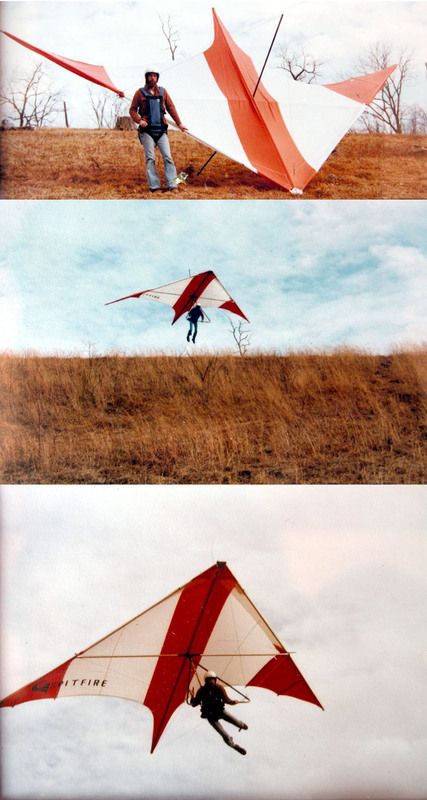 "I recall it was a very switchy, gusty day.